If there’s ever a time to go all in on a warm, cozy breakfast spread, it’s Christmas morning. Your family will be impressed. 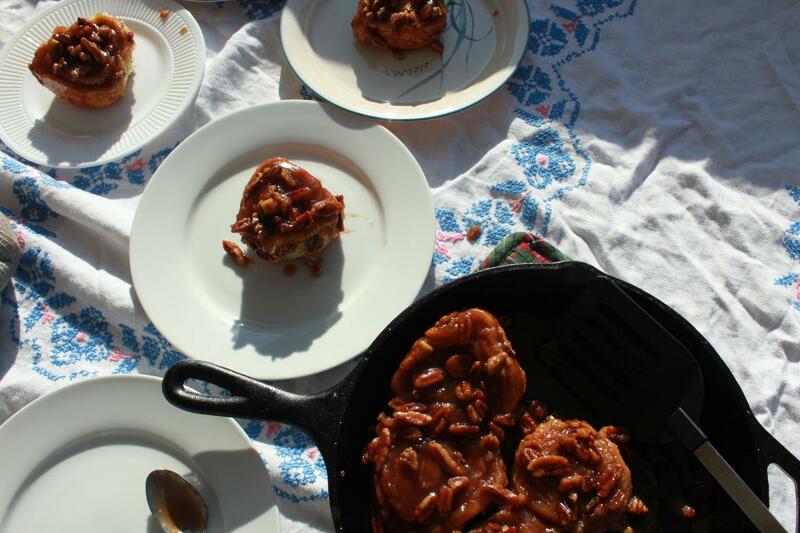 Nothing says “hygge” quite like gooey sticky buns, the cinnamon aroma wafting over the entire kitchen as they bake. I based the dough on the simple to assemble and easy to roll dough from King Arthur Flour, but wanted the over-the-top gooey topping from Boston’s own Flour Bakery, with a few alterations to keep it from veering into tooth-achingly sweet territory. I would highly recommend using the overnight rise variation noted below in the instructions. That way the work is done the day before and all you need to do is bake the buns in the morning. A final flourish of flaky sea salt adds balance. Mix sugars, cinnamon and pecans in a small bowl. Melt butter in a separate bowl and set aside until ready to roll the dough into a rectangle in stick bun instructions, step 5. In a medium saucepan, melt the butter over medium heat. Whisk in the brown sugar and cook, stirring, to combine. Remove from the heat and whisk in the honey, dark corn syrup, cream, water and salt. Let cool for about 30 minutes, or until cooled to room temperature. The mixture can be made up to 2 weeks in advance and stored in an airtight container in the refrigerator. To make the dough: Whisk the dry ingredients together, then stir in the water, sour cream, eggs, and vanilla extract. Mix and knead — by hand, mixer or bread machine — until you've have a very soft, smooth dough. Spray a large bowl with non-stick spray, play dough in the bowl and spray top of dough with non-stick spray. Cover with plastic wrap and allow the dough to rise for about 1 to 2 hours. It will become slightly puffy, but won't double in bulk. While the dough is rising, prepare the pan(s): use a 9" x 13" pan, or two 9" round pans. To assemble the buns: Transfer the dough to a lightly greased work surface, and roll it into a 16" x 20" rectangle. Spread it with the cinnamon filling and evening pour the melted butter over the dough, leaving an uncovered strip about 1" wide along one short edge of the dough. Starting with the filling-covered short edge, roll the dough into a log, and slice it into 16 slices, each about 1" wide. This can be done with unwaxed dental floss or a sharp serrated knife. Place the buns in the prepared pan(s), leaving about 1/2" between them. Cover the pan(s), and let the buns rise for 90 minutes; again, they won't rise much, they'll just seem to spread a bit. *Want to shape the buns, then refrigerate overnight and bake the next day? See note below. To bake the buns: Bake the sticky buns for 35 to 40 minutes, tenting them lightly with aluminum foil for the final 5 minutes if they appear to be browning too quickly. The finished buns will be golden brown. Remove the buns from the oven and allow to cool for 10 minutes. Loosen their edges with a knife, and carefully turn them out onto a 10’ cast iron pan, if using a 9” pan to bake the buns, or parchment-covered sheet pan to cool, scraping any glaze that may have stuck to the pan onto the buns. Sprinkle flaky sea salt evenly over the top of the buns at this point, if using. Use 1 teaspoon per 9” pan of sticky buns. Serve warm, or at room temperature. Store leftovers at room temperature, well wrapped, for several days; freeze for longer storage. *Note: Want to prep buns the night before and bake in the morning? Make the dough, shape the buns, and place them in the pan (with the topping); don't let them rise. Place the pan of buns in the refrigerator for up to 16 hours before you want to serve hot buns. Remove the buns from the fridge, and let them rest at room temperature for 1 hour. Bake them in a preheated 350°F oven for 35 minutes, until they're golden brown and the filling is bubbly. 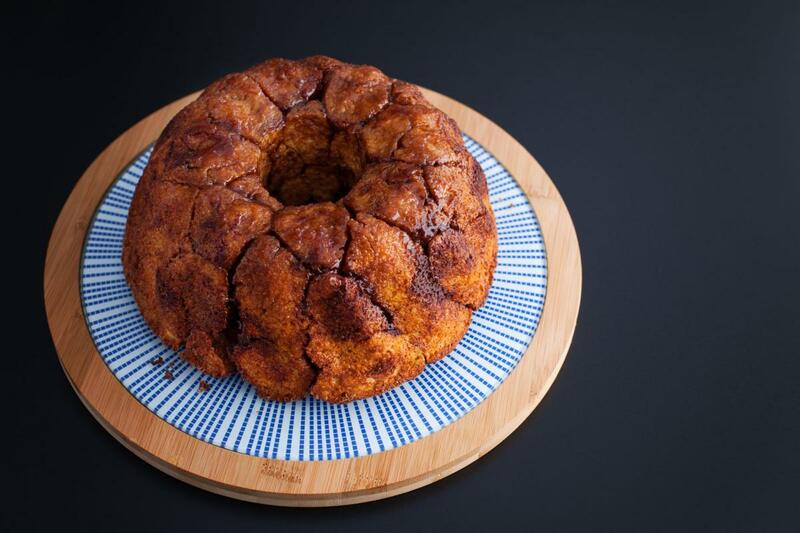 A close cousin to sticky buns, Monkey Bread is a perennial favorite for kids and adults alike. This version from Bon Appetit is nut-free. 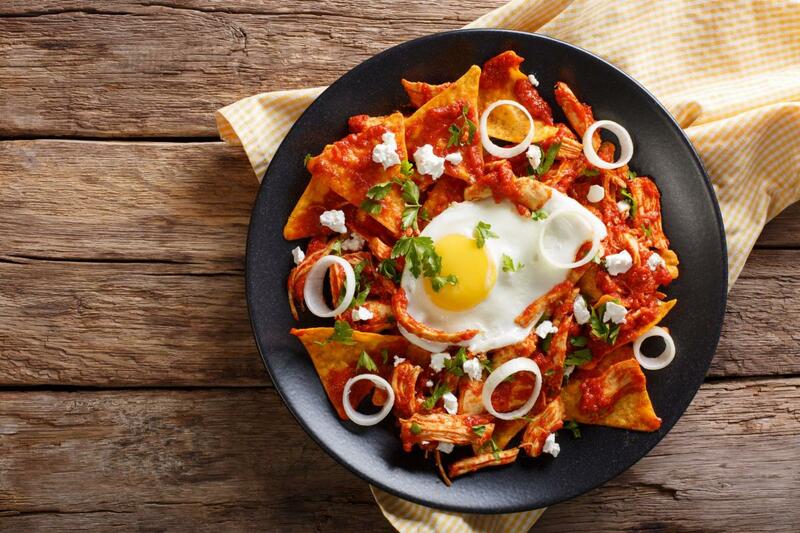 Crispy tortillas doused in a spicy chili sauce and topped with fried eggs. For those who prefer savory to sweet on their breakfast plate, give this recipe for chilaquiles verdes from Serious Eats a try. Fortify yourself against the harsh winter cold with the richness of cream, Gruyere and a pound of croissants. 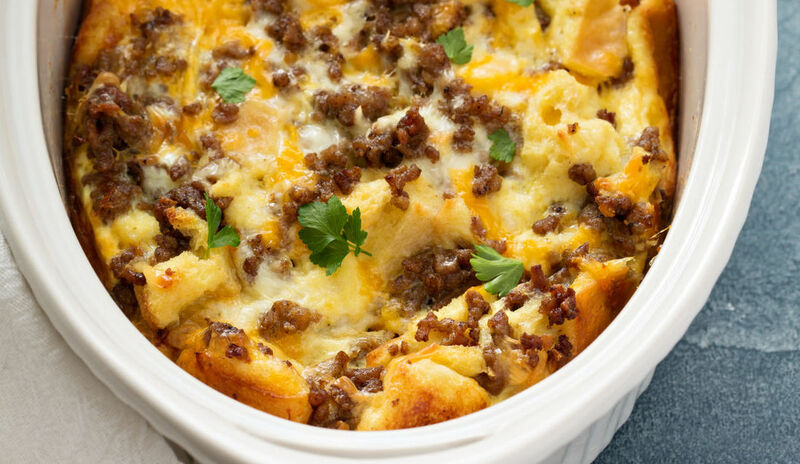 Stratas and breakfast casseroles, like this one from The New York Times can be made in advance. 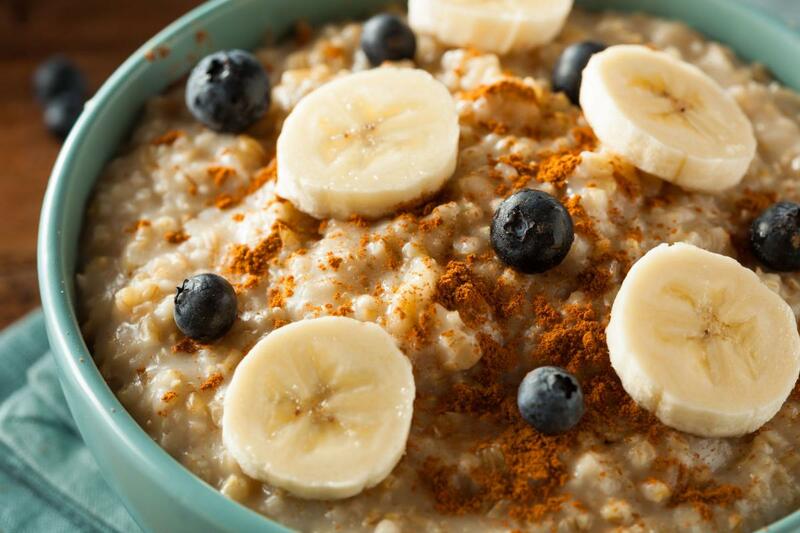 Seasonal spices and tangy buttermilk make this porridge luxurious and will warm your family from the inside out. This creative recipe from Saveur benefits from a confetti of healthy dried fruit and nuts.